After transferring to a new office last year, Tuitt has officially opened the doors to its second location in Metro Manila. Similar to its first location, the training lab in the GEMPC building maintains the company’s core concept, with a clean, traditional yet modern, innovative approach. Large LED screens and their own workstations await campers. The lab showcases a minimalist feel with lots of exposed wood throughout the interior which gives off the feeling of Zen. It is also Tuitt’s biggest training lab, yet. Mr. Alan Beraquit, the GEMPC lab’s project leader, worked tirelessly for 4 months just to make sure everything was ready come opening day. “Along with the expansion, we grow as a company. 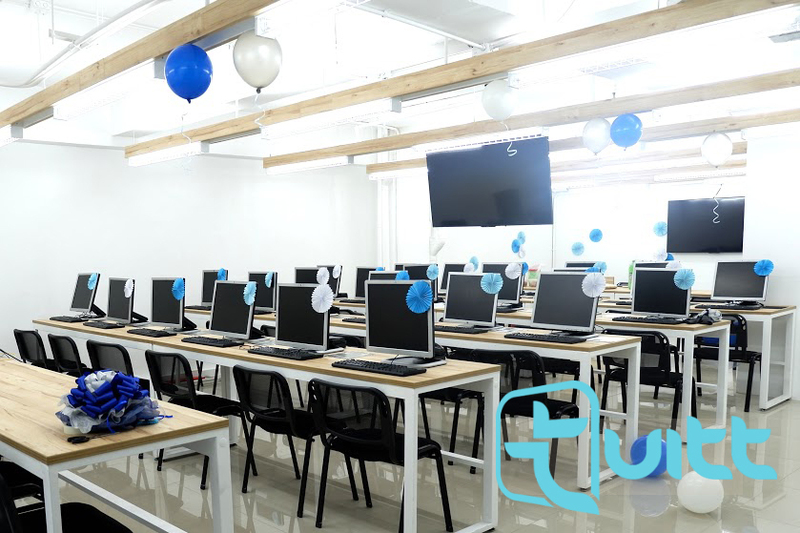 Not only with the number of students, but, we are happy that we were able to find competent individuals to handle this expansion with us,” said Ms. Mary Shemuel Unida, Tuitt’s CEO/Founder. For Tuitt founder Mr. Tomohisa Kato, a second training lab can only mean that we can welcome more aspiring individuals into the Tuitt family. After the ribbon cutting ceremonies, a feast awaited the attendees. Food. Lots of it. We have the HR team to thank for that. Everything was spot on. From the scrumptious food to the blue and silver balloons, everything seemed to complement each other. The rest of the afternoon was given to the attendees to catch up and mingle with one another. Everyone was excited to eat! Mr. Tom enjoying a laugh with one of our consultants, Ms. Carmela Anne Umali. Thanks to everyone who went to the opening! We really appreciate the support! That’s it for number 2. See you soon!